Firstborn son of Pieter Brueghel the elder, a renowned sixteenth-century painter of landscapes, rustic scenes, and peasant life, Pieter Brueghel the younger (Flemish, c. 1564–1637/1638) adopted a style similar to that of his father, who died when Pieter was five years old. Young Pieter’s formal art training probably began with his maternal grandmother, Mayken Verhulst van Aelst, an accomplished miniaturist, and continued with the landscape painter Gillis van Coninxloo in Antwerp, where in 1585 Pieter was registered as an independent master in the Guild of St. Luke. 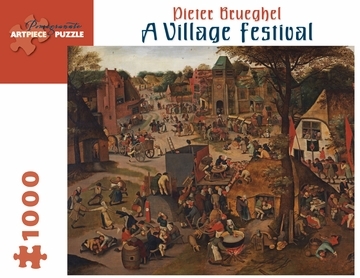 Although known as a superb copyist of his father’s paintings, which were much in demand, Pieter Brueghel the younger created a number of notable original genre and religious scenes. His 1632 painting A Village Festival, with a Theatrical Performance and a Procession in Honour of St. Hubert and St. Anthony, reproduced for this puzzle, is among the most popular of these works.